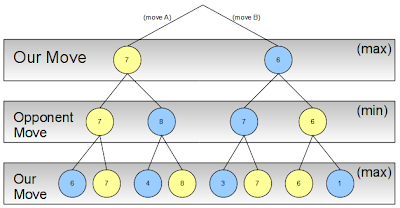 Since this challenge combines some interesting topics: AI, a game, a contest and optimization, I thought it might be interesting to post some conclusions here. Note that many of the topics here are already discussed at other websites and blogs. I will post references and links to those. Consider this as a general overview, a journal of my own tries, and a closer look at some common pitfalls. The challenge this year was all about Tron. 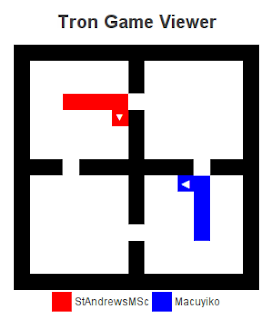 Tron is like two-player Snake, where your objective is to box in your opponent to force him to crash into a wall (or your or his own tail) before you do. Of course, this game was first introduced in the movie with the similar name: Tron. Only two teams, with one player per team. In other words: one versus one. No acceleration: everyone moves at the same speed. Your tail doesn’t vanish once you crash. Even if this would happen, it wouldn’t matter (once you’ve crashed you’ve lost anyway and the game ends). The playfield doesn’t necessarily start empty. # stands for a wall, and 1 and 2 are our two players on their starting positions. Let’s pit them against each other and see how they fare. We provide them with a very basic mode of intelligence: just pick any random direction if the space is free if possible. Player 1 is completely trapped and crashes into a wall. Player 2 wins. Random selection: as seen in the introduction: just pick an open space at random and move there. This is a bad strategy because often you will seperate yourself from your opponent, with less space to move in. Ordered selection: make a list of directions, e.g. [north, east, south, west]. Pick the first possible direction from the list. This will not seperate you from your opponent as quick (or foolish) as random selection, but will eventually end up in a bad seperation otherwise. Which is of course, not the optimal choice here. 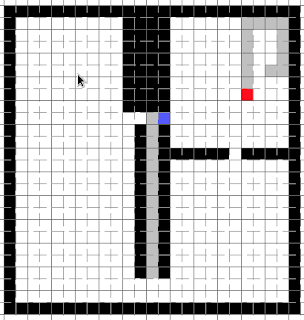 It is trivial to find other maps which break the left (or right, or ordered direction) wall hugging method. Wall hugging - another try: let’s see if we can fix the above problem. Let’s wallhug while following a rule (left or right hand, ordered direction or even random), but when we notice that a move would lead us into a new separate space which results in less possible moves than the other separated space, try the next move. 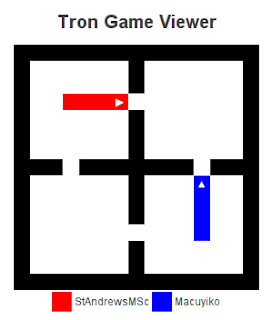 Enemy avoidance or chasing: run away from the enemy. 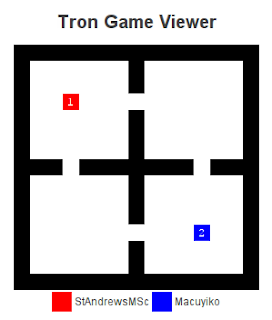 Pick the direction which is farthest away from the opponent. We can also reverse this strategy: move as close to the opponent as possible. Both are easy to implement, so which one do we pick? In most maps, chasing will result in a draw against other chasers (suicidal behavior), and in a win against runners. Runners on the other hand will often draw against runners. Most player pick a chasing, aggressive bot. And since drawing is better than losing, we have no choice but to use an aggressive bot ourselves to increase our chances. Most open destination: uses some simple rules to pick the direction which ends up giving us the most open spaces. We already used this a bit in our improvement of our wall hugging algorithm. The website also mentions near and far strategies, but we’ll take a look at those later. When we’re not separated from the opponent: try to separate him into a space so that we have more remaining moves than him. Once we are separated: try to fill our available moves in the best possible way. 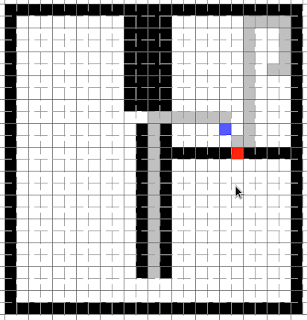 However, there are situations where flood-fill can be tricked into entering a trap: an area that looks big, but in which your bot cannot move freely. So, while this strategy works for most situations and is an easy addition to a good near strategy, it doesn’t cover all situations. 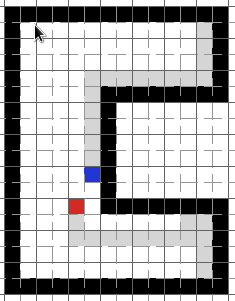 What your bot is effectively trying to do in a survival situation is to find the longest path in the board starting at your current position. 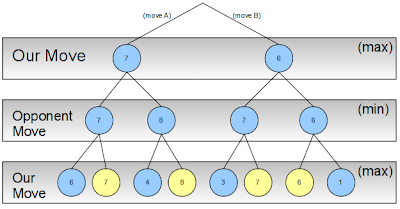 Unfortunately, the longest-path problem itself is NP-complete, which means that, barring a miracle in Computer Science (namely, the unlikely result that P=NP), it is very difficult in general to find this longest path. All hope is not lost, however: there are some decent approximations you can make which run reasonably quickly and avoid traps like those described above. One such approach is based on articulation vertices on the board. 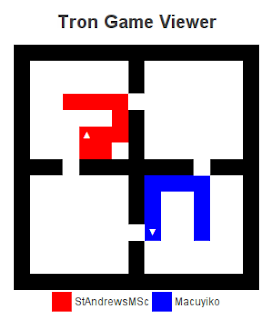 An articulation vertex on a Tron board is a space which, if it were filled in by a wall or trail, would cut the area it is in into two or more disconnected areas. 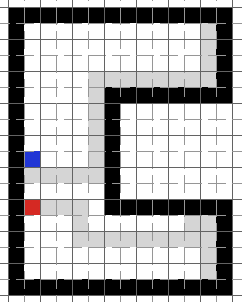 For a given square, if it is an articulation vertex which cuts the area into three or more disconnected areas, then it is impossible for your bot to visit all three areas, which gives you an easy way to determine how many squares are impossible to visit. By computing the articulation vertices in the board, you can obtain a better approximation of the number of free squares which can be visited, and thus fill your space more efficiently. Keep the definition of articulation vertices in mind, we will mention this again later. I decided to use a simple but quick heuristic to figure out a way of filling the board. It’s quick and works good enough most of the times (meaning that once we’re seperated and have more empty space, we have a high chance of actually winning). Now: what do we do if we’re not seperated…? On option is to use a minimax strategy. Minimax is a decision rule which maximizes our potential gain while minimizing our possible loss. It can be used in two player games where it is possible to assign a value (or score) to each decision for each player. 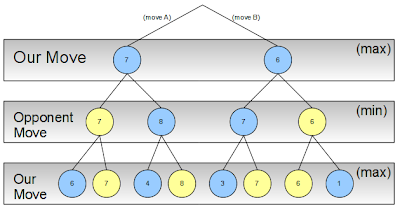 As you see in the search tree above, for each of our two moves A or B, our opponent can also make two moves. Then we move again. The strategy we’ll be following is max(imize our gain). Our opponent will try to min(imize our gain). By inverting the score each time we propagate upwards, we can use max at every level. The strategy page recommends following a minimax strategy to avoid traps or dead ends. It is clear that, to create a winning minimax strategy, we must give sensible scores to each of the game states. A lot of players are thus using minimax strategies and doing well to very well with them. It’s also fairly logical that the more levels you search, the higher your chance of winning becomes. 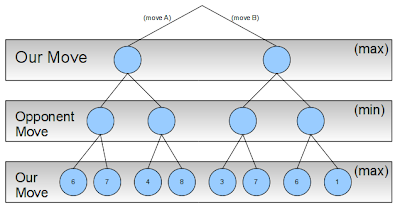 However, since bots are only given one second to think before each move, exploring a high number of levels is impossible, especially in interpreted languages. It’s no wonder that many high-ranked players are using C++. The Wikipedia page on Minimax gives examples and pseudocode. 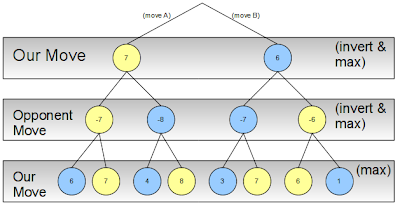 The Wikipedia page on alpha-beta pruning does the same for this technique. The pseudocode is not hard to implement once you understand minimax, and does speed things up a lot! 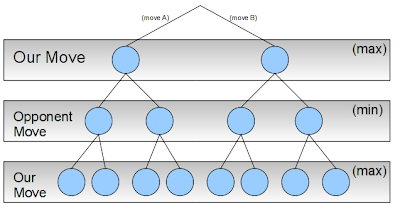 Also iterative deepening is explained on Wikipedia; it’s easy to understand, but a bit harder to implement. Another contestant has explained his minimax strategy on his website. He does a fantastic job explaining the concepts above, and even provides a starting point for an evaluation function you can use to assign a score to the board. Jamie, another contestant, also discusses his techniques in his blog, he even links to some interesting Python source code. A quick Google search finds some interesting minimax and alpha beta pruning code written in Python. It plays Othello, but the AI and game logic are cleanly separated. Now that we have a basic understanding of the workings of a Tron bot and strategy, we can Google around to see if we come up with some interesting projects using these methods. Let’s see what some of the open source Tron games are using as a strategy. It turns out this code is using a simple strategy. 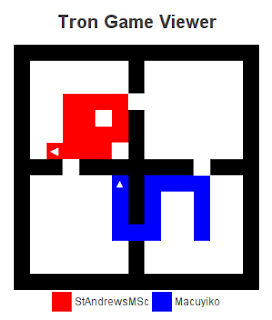 The difficulty of the game lies in the fact that player can move slow (easy) or very fast (very hard). The AI looks at the distance before reaching a wall while heading in its current direction. The closer it comes, the higher the chance of turning. When we’re next to a wall, the chance is, of course, 100%. A final search on Google code turns up some source code written for an AI class at Rutgers University. They provide C# code for different players and strategies, including a minimax player. On a random hunch I decided to try writing a bot without using minimax. I wanted to see how far I would get with (simple) heuristics and sound thinking. Check in all four directions: where is the nearest wall? What would happen if we go to this wall, would this seperate us from our opponent? And would we get more moves in our space? And can we get to that wall faster than our opponent? Go to that wall and trap him! This rudimentary bot has been doing very well and even scored in the top 30 for some time (alas, the ranking graphs have been taken offline, otherwise I would embed it here). However, a lot of players have been improving their code lately, causing me to drop back in the 100s. Lately I’ve been observing some interesting cases which can occur. You could call the first one the chamber or gateway problem. Remember the definition of articulation vertices above? A final check I implemented looks at those little “gateways” and checks if our opponent can reach those faster than us, and if this would result in us being blocked off with less moves. If such a gateway exists, it’s better to go the other way. This is a sure win. I modified the code once more to avoid this situation. The name “Chicken” has its origins in a game in which two drivers drive towards each other on a collision course: one must swerve, or both may die in the crash, but if one driver swerves and the other does not, the one who swerved will be called a “chicken,” meaning a coward; this terminology is most prevalent in political science and economics. Can you see what’s happening here? The blue player plays it safe and moves out of the way early on. However, this causes the red player to end up with more space. If one of them moves out of the way, the other one wins. If they both don’t move, they draw. Figuring out when to crash (and draw), or when it’s better to move is a difficult challenge, especially for minimax strategies which often try to play it safe, as shown above. Many strategies I’ve discussed before and others are posted on the contest’s forum. All in all this was an interesting and fun journey. My high rankings seem completely behind me though, but I’m glad I tried something different instead of following the obvious road. If you’ve been trying to write a bot as well: I hope you had a great experience as well, otherwise I hope you’ve enjoyed reading this little overview. I might talk about minimax and other mentioned topics again some time. Also: I should’ve started sooner taking a serious look at this contest. I get distracted too quickly :). The contest organizers also put together a Youtube video showing some matches. It’s interesting to see how bots either try (or fail) to trap each other, and how the use the available space.